Red jeans are so in. In fact anything presenting an opportunity to colour block made its way to the celebrity closets and automatically to ours via loyal fashion bloggers. The likes of Nicky Hilton, Charlize Theorn, Jessica Alba, Molly Sims, the Kardashian clan and the rest of Hollywood is rocking the jeans of colour, and red is taking centre stage. You too can join them with your own copycat look for cheap. Woolies has a range of colourful denim jeans for R275. They look stunning. Passionately referred to as Ponti Skinnies. The front has a zip trim on the pockets. Its great and stretchy with all 70% polyester, 28% viscose and 2% elastane. 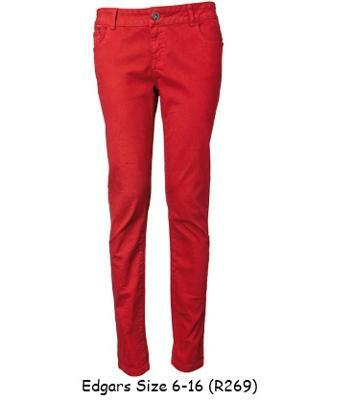 For an alternative try Edgars' Flame Scarlet Denim Jeans. Its part of their Free 2bu range. You are likely to get a size if you are between size 6 and 16. Then comes Mr Price with just the price most are looking for, R120. No excuse for you not to rock the red jeans like the rest of them now. Don't miss on our next review and Pretoria Lifestyle news by subscribing to our newsletter. The form is on your top right. Red jeans really look beautiful,you have set up great fashion website.I enjoyed reading the stuff which you have posted. Summer is time to live in shorts and a t-shirt, and I’ve been meaning to share some wonderful small businesses that make it easy to wear your heart on your sleeve blue ribbon t shirts sale. Many people unite the humble custom t-shirt with social occasion such as stag parties, group trips abroad and cheesy birthday presents, but personalised garments can actually be a great idea for business too; whether for attract new customers or creating brand insomnia. I appreciate that this house doesn't look like all the others. And is owned by someone who doesn't necessarily write a blog. While the other features on this website are lovely, I was beginning to think that The Every girl only features one type of girl (must be a blogger or designer of some type, even though this inspiring woman is a fashion designer) with one type of home. Red color is really very in. 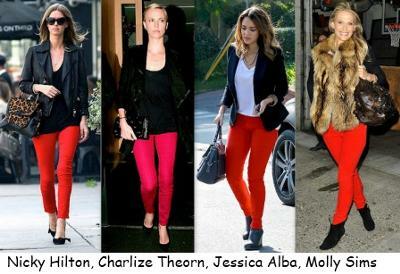 I've been seeing the people wearing such red color whether pants or jackets. Join in and write your own page! It's easy to do. How? Simply click here to return to Fashion, Style and Beauty.